MULTIPLY will build on existing work in the team to develop a new platform for joint and consistent retrieval of Copernicus SENTINEL data and beyond. 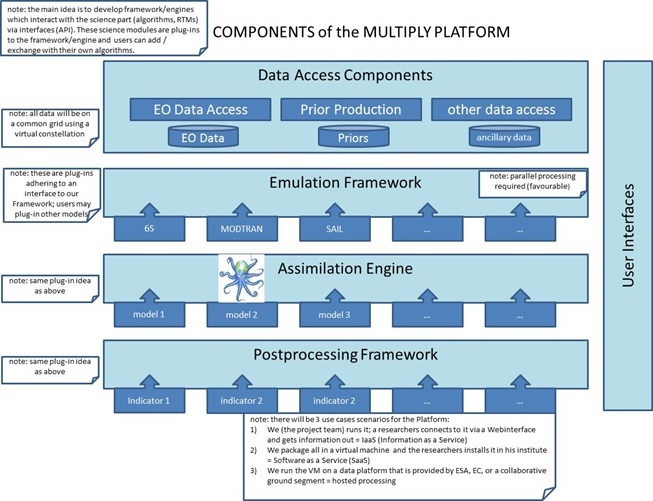 To achieve a significantly wider use of EO-data in general and SENTINEL data in particular, by design the MULTIPLY platform tackles a number of critical challenges of current retrieval schemes. These include data access, uncertainty/quality treatment, data gaps, pre-processing complications, combining data from different sensors and inconsistencies between data streams. This design is based on state-of-the-art integrated data assimilation principles. An interactive tutorial explaining some of the main concepts behind the data assimilation approach used in the project has been produced in the form of a Jupyter notebook. The notebook contains a combination of Python code and tutorial explanations to show the assimilation of EO data and radiative transfer models to retrieve land surface parameters. 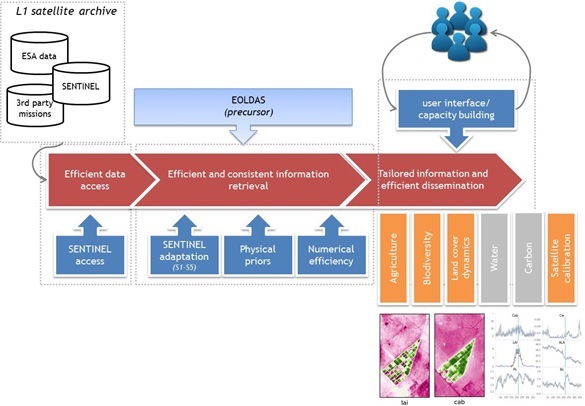 The Data Access Components include the access to EO data, i.e. to historic data archives as well as to SENTINEL 1, 2 and 3 (and later Sentinel 6). This will be through the ESA Science Data Hub, EUMETSAT Eumetcast or national collaborative ground segments. This data access to the EO archives is configurable to ingest data from the various sources. The second element under this component is the priors, which are also “static” input to the subsequent processing and hence are considered part of the data access component. Finally, there is a component to access other required data, such as ERA Interim meteorological data from ECMWF for the radiative transfer models. All data from all elements will finally be brought to the same common grid. The emulation framework and the assimilation engine are the core of the platform. They will be realised as a generic processing environment, in which the RTMs (for the emulation framework) and the models (for the DA engine) are plugged-in. The post-processing framework follows the same logic that specific post-processing operators can be plugged into a processing framework. An application programming interface (API; a set of routines, protocols, and tools for building software applications) will be provided that offers the data in a common data model and provides all control structures to work on the data. We will rely on the Graph Processing Framework (from the ESA Sentinel Toolboxes) for this purpose. Users can also plug in their own APIs within our generically set-up software framework. Likewise, each API can be easily updated with a new version following new scientific insights.